MOSCOW, January 12. /TASS/. Russia’s Splav Research and Production Association has started developing a prototype of the next-generation wheeled-chassis heavy flame-throwing system dubbed Tosochka, CEO of Techmash Holding Company Vladimir Lepin said on Friday. 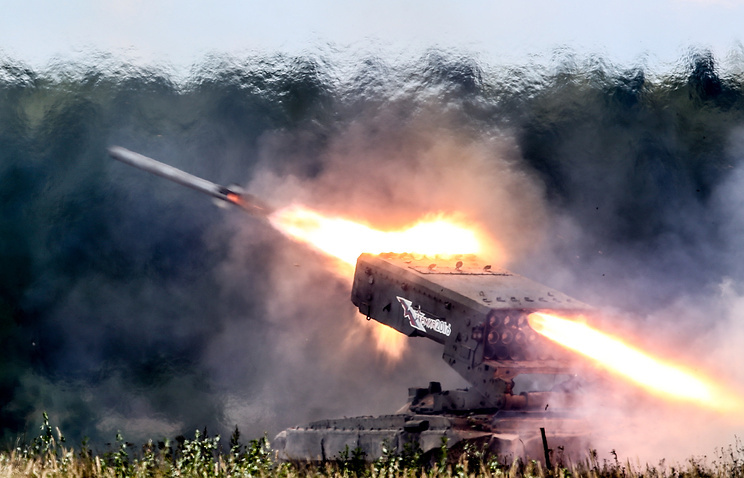 "The Splav Research and Production Association is carrying out work to develop a prototype of the Tosochka new-generation heavy flame-throwing system for preliminary trials. The system with the improved characteristics will be mounted on a wheeled chassis," he said. WNU Editor: The current Russian flame-throwing system is being used in Syria .... Russia to use TOS-1A flamethrower rocket launcher in Syria (Army Recognition).